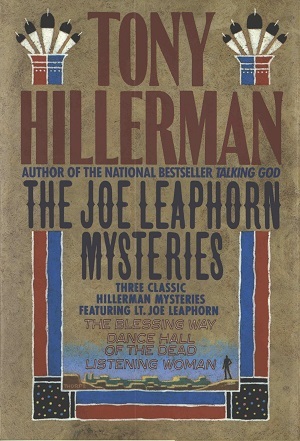 This is the first edition hardback copy of The Joe Leaphorn Mysteries: Three Classic Hillerman Mysteries Featuring Lt. Joe Leaphorn. This is an anthology of the first three novels in the Navajo Mystery Series, including: The Blessing Way (1970), Dance Hall of the Dead (1973), and Listening Woman (1978). This edition was published in 1989 by Harper & Row Publishers in New York City, New York. The illustration of the cover was designed by Peter Thorpe and features the outline of a man with his right hand resting on his hip surrounded by a sand painting stylized Southwestern vista. Binding: Oatmeal boards with a red cloth spine and the author, title, and publisher printed in gold on the spine.